Many commentators relate the diffuse, somewhat leaderless nature of the uprisings in Egypt and Tunisia (and now spreading elsewhere) with the prominent role social-media-enabled peer-to-peer networks played in these movements. While I remain agnostic but open to the possibility that these movements are more diffuse partially due to the media ecology, it is wrong to assume that open networks “naturally” facilitate “leaderless” or horizontal structures. On the contrary, an examination of dynamics in such networks, and many examples from history, show that such set-ups often quickly evolve into very hierarchical and ossified networks not in spite of, but because of, their initial open nature. I agree and have said before that this was the revolution of a networked public, and as such, not dominated by traditional structures such as political parties or trade-unions (although such organizations played a major role, especially towards the end). I have also written about how this lack of well-defined political structure might be both a weakness and a strength. A fact little-understood but pertinent to this discussion, however, is that relatively flat networks can quickly generate hierarchical structures even without any attempt at a power grab by emergent leaders or by any organizational, coordinated action. In fact, this often occurs through a perfectly natural process, known as preferential attachment, which is very common to social and other kinds of networks. In order to understand how this process works, consider the potential mechanisms by which a node in a network grows in importance. Let’s do a short-hand conceptualization and accept the number of followers in a Twitter network as a measure of importance. 1- Random growth: Here, we can assume that everyone gets some number of followers every time they tweet and that it all averages out over time. Nobody has any particular advantage and over time, most everyone acquires some followers, although some more than others. This is analogous to the movement of gas molecules in containers: they all bounce around in a way that is impossible to calculate, but important parameters (like temperature) can be calculated very accurately as averages. Random does not mean without a pattern–this would not mean it all end ups with everyone as equal but rather with a Maxwell-Boltzmann-type distribution. For a fascinating study of how the bulk of the economy (except for the very rich) function in this manner, see this paper by Victor Yakovenko . 2- Meritorious growth: In this model, the better, the more relevant, the more informative your tweets, the more followers you get. Surely, there is a lot of this going on. While this sounds good, it brings us to the next question: how will people know your tweets are so good? One mechanism, of course, is retweets. The number of retweets, however, may depend on how many followers you have to catch and retweet your posts in the first place. This means that those who have a large number of followers end up with an advantage even in terms of being recognized as meritorious. (Recent studies do show that influence is a lot more complicated than number of followers, but we are trying to abstract some basic mechanisms, so this will do for the moment). In the preferential attachment scenario, the more followers you have, the more followers you will add, ceteris paribus – i.e. even if the merit of your tweets is the same as someone of fewer followers, your followers will grow at a faster rate. Multiple mechanisms can facilitate preferential attachment — this need not be a mere exposure effect but will likely be confounded by a popularity effect. In almost all human processes, already having a high status makes it easier to claim and re-entrench that high-status. Thus, not only will more people see your tweets, they will see you as having the mark of approval of the community as expressed in your follower count. This third kind of process, defined by preferential-attachment dynamics, tends to give rise to what network scientists call “scale free” networks, which end up exhibiting power-law distributions. (They are scale invariant because they look the same at whatever scale you look at). Sometimes informally-called the 80-20 networks, such networks are very common in multiple natural and social processes and create top-heavy structures in which a few have a lot and most have fairly little. (See this related paper by Yakovenko for an analysis of how the rich really are different than you and me in that their wealth indeed accumulates by power-law dynamics. They really are getting richer because they are rich to begin with). So, what does all this have to do with revolutions and leaders? A lot, it turns out. Preferential attachment means that a network exhibiting this dynamic can quickly transform from a flat, relatively unhierarchical one to a very hierarchical one – unless strong counter-measures are quickly and firmly employed. It is not enough for the network to start out as relatively flat and it is not enough for the current high-influence people to wish it to remain flat, and it is certainly not enough to assume that widespread use of social media will somehow automatically support and sustain flat and diffuse networks. On the contrary, influence in the online world can actually spontaneously exhibit even sharper all-or-nothing dynamics compared to the offline world, with everything below a certain threshold becoming increasingly weaker while those who first manage to cross the threshold becoming widely popular. (Imagine Farmville versus hundreds of games nobody plays. In fact, don’t imagine this and read this great study by Jukka-Pekka and Reed-Tsochas that was just published in the Proceedings of the National Academy of Sciences. Turns out that’s exactly how app diffusion on Facebook works). First, let me say that many late-20th century uprisings which predate the Internet happened without strong leadership so a “leaderless revolution” is not a new phenomenon. Iran in 1979 did not start as a theocratic movement at all—the despotic and unpopular Shah was overthrown by a broad-based movement including the secular middle-classes, organized labor, communists, etc. Many of the 1989 revolutions did not have strong leadership as they were happening. My initial impression is that the Egyptian and Tunisian uprisings have been even more diffuse and that this is related to the role social media played in facilitating certain kinds of organizing—but I am willing to remain agnostic on that question till we have more data. To try to understand whether this might be happening in Egypt, I used this “infograph” –which is, in fact, visualization of a social network analysis of Twitter users employing the hashtag “Jan 25”—to identify some of the more influential nodes. (In this graph, influence is visualized as size; the bigger, the more influential) Not having the underlying data, I eyeballed the graph and asked my twitter friends for names of Egyptians with an influential social media presence. Thus, while my final list is somewhat arbitrary, let me assure you that I tried many variations of this top 10 out of the potential few hundred and constantly found the same pattern. In the one I present here, I’ve included male as well as female micro-bloggers, those tweeting in only Arabic as well as those tweeting in English and Arabic and two traditional politicians, Ayman Nour (@ayman_nour) and Mohamed El-Baradei (@ElBaradei). (Baradei was not included in the infograph but I added him due to his obvious importance. I tried to check for other potential figures as well, none were as prominent). What I found is that @ghonim, or Wael Ghonim, and @ElBaradei, Mohamed El-Baradei, are both definitely showing a different kind of growth-pattern compared to every other person of influence I have tested them against in this portion of the twitter-verse. Of course, you can see this pattern without any quantitative analysis; Ghonim is the one that has been crowned the “leader of the leaderless revolution” by Newsweek and he’s the one who is tweeting about meeting with top generals in the military. 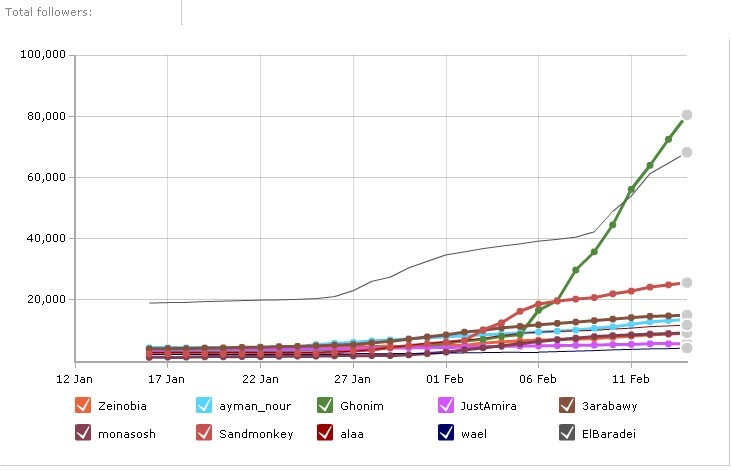 Take a look at his and Baradei’s follower growth compared to 10 other top tweeters. By all accounts, Wael Ghonim deserves an important leadership role. I absolutely do not mean for this post to be taken as a personal assessment of any leader of this nascent revolution. In fact, the point is that it does not matter who they are. Wael Ghonim especially has been careful to talk about how this is a revolution without heroes because so many are heroes—starting, of course, with the hundreds of people who lost their lives. He has dubbed the Egyptian uprising “Revolution 2.0” and has constantly talked about keeping it participatory, especially through the use of social media. However, Ghonim and other emerging leaders of this revolution would be well-advised to keep in mind that social media not only do not guard against one of the strongest findings of sociology called the “iron law of oligarchy,” they may even facilitate it. The iron law of oligarchy works rather simply. Basically, take an organization. Any organization. Stir a bit. Wait. Not too long. Watch a group of insiders emerge and vigorously defend their turf, and almost always succeed. (Example one could be Western democracies — See work by Robert Michels for more details). Further, revolutions almost always depend upon or create figures who possess what sociologists call charismatic authority. Both of these processes are so widespread in human history that it would be foolish to ever discount them. But to discount them by hoping that social media, as it stands, can provide a strong-counter force would be naïve. In fact, if anything, it is quite likely that preferential-attachment processes are part of the reason for the rise of oligarchies and charismatic authorities. Ironically, this effect is likely exacerbated in peer-to-peer media where everything is accessible to everybody. Since it is just as easy to look at one person’s twitter feed as another’s, no matter where you are or where the other person is, it is easier to draw more from the total pool and further entrenching an advantage compared to the offline world where there are more barriers to exposure and attachment. Thus, networks which start out as diffuse can and likely will quickly evolve into hierarchies not in spite but because of their open and flat nature. Disposition is not destiny. In one of my favorite books as a teenager, The Dispossessed, Ursula K. Leguin imagines a utopian colony under harsh conditions and describes their attempts to guard against the rise of such a ossified leadership through multiple mechanisms: rotation of jobs, refusal of titles, attempts to use a language that is based on sharing and utility rather than possession and others. The novel does not resolve if it is all futile but certainly conveys the yearning for a truly egalitarian society. If the nascent revolutionaries in Egypt are successful in finding ways in which a movement can leverage social media to remain broad-based, diffused and participatory, they will truly help launch a new era beyond their already remarkable achievements. Such a possibility, however, requires a clear understanding of how networks operate and an explicit aversion to naïve or hopeful assumptions about how structures which allow for horizontal congregation will necessarily facilitate a future that is non-hierarchical, horizontal and participatory. Just like the Egyptian revolution was facilitated by digital media but succeeded through the bravery, sacrifice, intelligence and persistence of its people, ensuring a participatory future can only come through hard work as well as the diligent application of thoughtful principles to these new tools and beyond. This entry was posted in Uncategorized on February 14, 2011 by zeynep. I was interviewed earlier today by Voice of America in Turkish. Yes, the interview is in Turkish. (VoA page for the interview can be found here). P.S. I just installed this plug-in so I’m hoping it works well across browsers. If the controls to play aren’t visible, try right-clicking on the image. There is an option to make controls visible and another one to play the video. PPS. Yes, I got a haircut between yesterday’s interview and today’s. This entry was posted in Uncategorized and tagged media on February 10, 2011 by zeynep. Let’s Mess with Stereotypes: Is Social Media Finally There? Perhaps no region of the world is more subject to stereotypes than the Middle East. Being a woman from that region, I have encountered these stereotypes on many occasions. While I was a teen, my family lived in Europe for a few years where I was often asked question reflecting these stereotypes. Do all Turkish women wear the headscarf? Um, obviously not. Do you ride camels? I have never seen one in my life outside of a zoo. At one dinner party, I witnessed my mother get interrogated on whether she was just dressing in a modern way because she was now in Europe. She kept trying to explain that she had changed nothing in her wardrobe. “But, can you actually wear a one-piece bathing suit to swim in a beach,” one of her obnoxious interrogators persisted, unable to believe she might be telling the truth. “Well, now that I am a bit older, I do wear the top as well,” she deadpanned. Ah, the joys of messing with stereotypes. It’s not that people outside the region should not be interested in these questions. These are important topics. And perhaps no issue is more complicated than that of the headscarf and what it means for women in Middle Eastern societies. It’s truly complicated. The issue of women’s rights and their presence in the public sphere ranges from appalling to you’d be surprised. I cannot go into the topic in depth it one blog pos, but suffice it to say is that it is neither always a direct sign of passivity and enforced subjugation, nor is it always a freely-asserted choice with no other implications. I think this directly links to the other issue of the culture of masculinity in the Middle East. This, too, is complicated, ever-changing and very dynamic. And I think nothing demonstrates this better than the emergence of a new kind of hero in Egypt– one that breaks down sobbing on television when contemplating the unimaginable loss of parents whose children were killed by the regime. In the now famous interview, at one point, Wael Ghonim asserts that “we are men and not children” and that “we are ready to die but not willing to raise a hand against anyone” asserting both a new kind of masculinity and generational manifesto. Of course, we know that this did not happen for any of the above-mentioned technologies. For one thing, being able to glimpse each other’s lives does not magically cure us of prejudices; it may even make them worse by providing ammunition for forces of hatred. As we saw in the Rwanda Genocide, radio broadcasts played an ugly role in inciting and coordinating the violence. And cyberspace is full of vitriolic racism which had been largely pushed behind closed doors. However, a difference worth thinking about is that all of the technologies named above were never implemented in a true “peer-to-peer powered broadcast” at a global scale–the one with most promise, the radio, was quickly taken away from the enthusiasts and the amateurs by corporate interests and the military. Television basically inherited that framework from radio while sharpening its monopolistic nature. And the telephone was never a broadcast medium. Will social media break this pattern of co-optation by the powerful and the hateful? I am more hopeful for this medium because the Internet combines peer-to-peer structure along with rich-media broadcast capabilities. No previous technology had this particular combination. Telephone was peer-to-peer but you could not truly talk to strangers and it was limited to voice. Television barely had a chance to be anything beyond a vehicle for delivering eyeballs to advertisers in most countries, and has never truly been controlled by a non-state or non-corporate entity. In any case, next time I get a question asking me for my soundbite answer on the issue of the headscarf or masculinity in the Middle East, I will start with “It’s complicated,” continue with directing people to images such as these and then ask if the person is actually interested in discussing this question in a manner that goes beyond the boring, predictable and too-simple-even-to-wrong images that dominate Hollywood and a lot of television. This entry was posted in Uncategorized on February 10, 2011 by zeynep. This entry was posted in Uncategorized on February 9, 2011 by zeynep. In his latest missive about the role of social media in political movements, Malcolm Gladwell makes two points: one so trivial to be barely worth dismissing and another one which is important, utterly wrong, and worth engaging with. First, he correctly points out that the French Revolution occurred without Twitter or Facebook. Good to know. Counterfactuals can be useful when deployed with care but this one is surely not meant seriously. In fact, it is so unserious that Twitter’s 140 character limit is more than enough and I have nothing beyond my first tweet on the subject: Humans also lived through the Pleistocene — is everything since then irrelevant? Not only is this wrong, it is the opposite of the thesis of his earlier, substantive New Yorker piece where he argued for how overreliance on social media made modern forms of organizing less effective. Gladwell was for the importance of the “how” before he was against it. I understand the appeal of being a contrarian. But one needs a little more substance to explain this kind of u-turn against oneself within a few months. The “how” of social organizing matter because means of connectivity impact the nature of a movement, the chance for its success, the tactics it can adopt–which in turn, impact its character–, the roles in can play, and the measures the state can deploy against it. All of these shape the nature, outlook and the reach of the movement. Let’s take a specific look at how the “how” or organizing appears to have had an impact in the latest events in Tunisia and Egypt. 1- Both of these movements have arisen without being directed by a well-defined political party and are not expressed through a well-defined programme. This is both their strength and their weakness. This trend of “non-political” politics precedes the spread of the Internet but has clearly accelerated along with the spread of the Internet and is in direct contrast with social movements of early 20th century. 2- These protests were first kindled through Facebook and other social media which are integrated into rhythms of mundane sociality. This means that rather than being directed at first by a well-defined group of activists who were able to reach only other politically-motivated compatriots, the dissent and the protests propagated through ordinary social networks which, in turn, ensures that the movement is broad-based. Consequently, both the Tunisian and the Egyptian protests have so far been able to avoid balkanization that plagues opposition movements in similar situations. 3- Both movements have so far only been able to express straightforward demands. “Out with the dictator, in with the elections.” (Similarly, other movements of this kind have sprung up in reaction to stolen elections). This is partly because there is no political leadership with whom there could be negotiations, no programme which outlines a list of demands, no spokespeople who can clarify and expand upon issues. While this seems utopian, and certainly has positive sides, it introduces weaknesses–especially by constricting the demands to the absolute minimum common denominator. 5- Thus, social media probably has so far been best at triggering a “empire has no clothes” moment. The role such tools play in situations where there is polarization and strong vested-interests on multiple sides remains unclear. In polarized situations, this dynamic might increase polarization through the facilitation of the “dailyme” in which people filter out dissent from their exposure stream and retreat into epistemic enclosures of the like-minded. 6- To highlight the importance of “how” let’s take Gladwell’s favorite tool, the counterfactual, and imagine a movement that was organized in Tunisia the old-fashioned way, i.e. through building of a political opposition party in a repressive regimes. First, the movement would likely only spread through the most-committed dissidents whose numbers are never large and are easy-pickings for police states. Evgeny Morozov repeatedly highlights how social media increases state capacity for state to surveillance. That is certainly worth considering. However, as I argued here, surveillance is not that useful when the opposition activity is completely entangled with everyday sociality of millions of people and when dissent is widespread. Thus, our word-of-mouth movement would struggle to grow person-by-person and would be easily outmatched by the state security apparatus. It might be able to put together brave and small demonstrations here and there—the news of which would likely never travel beyond the lonely corner in which they were staged. Even if they managed to get some critical traction in a locality, the state could more easily counter, encircle and repress because unlike the current protests in Egypt and Tunisia, which started rapidly and emerged through a broad-base all at once, authoritarian regimes have a pretty advanced-arsenal against old-fashioned political organizing. The “how” of organizing often turns into “how” of governance. Our word-of-mouth movement would likely have to remain secretive and suspicious. Does anyone think that it is completely coincidence that successful revolutions by secretive movements often turn into paranoid governments? If for no other reason, this is why the “how” is crucially important. But, it is true counterfactuals are always a little shaky. But we do have a test case. In 2008, protests led by the local trade-union broke out in the Tunisian mining-town of Gafsa over corruption, unemployment and nepotism. Did you know about them? Neither did I, until recently. However, the story is familiar. Tunisian government forces encircled the town, brought in the army when the police proved unable to contain the unrest, kicked out and jailed the journalists trying to cover the story. Isolated and censored, the protests dissipated. (See here, here and here). Is the spread and integration of social media into everyday rhythms of Tunisian (and global) populace between 2008 and 2011 a factor in why the world has barely heard of Gafsa while Sidi Bouzid is nearly a household name around the globe? Obviously, there cannot be a definitive answer. However, this is surely worth exploring and a striking example of the “how” of social movements has such profound consequences beyond being fodder for contrarian missives about their irrelevance. P.S. Edited because there were two points marked as number four. Doh! PPS I recommend two more excellent pieces with further thoughts on this topic. Here‘s the one by Dave Parry who makes some some similar arguments and extends the discussion with his usual intellectual firepower. And here‘s a great post David Weinberger who’s just had enough! This entry was posted in Uncategorized on February 4, 2011 by zeynep.